On my first visit to the terminal I found myself parking in the lot furthest away. As luck would have it this is where I needed to be just to take in the entire complex. Built upon 287 acres on what was once Lincoln Park, home of America's first professional baseball team the Cincinnati Red Stockings. Their ball field was known as the Union Grounds and the home plate area is today remembered by a stone marker near the approach to the main entrance. The terminal itself was constructed upon filled ground over the old Lincoln Park Lake. The idea of combining Cincinnati’s 7 railway lines and 5 separate stations into a central and effective hub began gaining ground in the early 1900s. Due to the inability of all parties to reach agreement and America's entry into World War I the project was placed on hold. 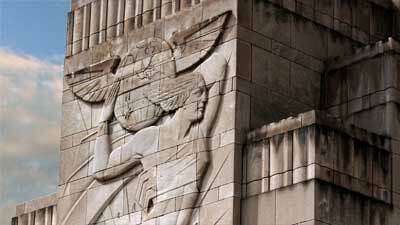 It wasn't until November 1927 that the Cincinnati Union Terminal Company was incorporated and New York architects Alfred Fellheimer and Steward Wagner were chosen to design the terminal. These architects were well known leaders in urban railway station design. Fellheimer was the main architect for the New York Grand Central Terminal. Their first designs were classic in style but with the additional consultation of Paul Cret the design turned to art deco. Paul Phillipe Cret was born in France but made America his home. He designed the Flanders Field American Cemetery Memorial and the Eternal Light Peace Memorial at the Gettysburg Battlefield. Mr. Cert. also designed art deco side fluting for the Burlington Pioneer Zephyr and passenger cars for the Santa Fe Super Chief. 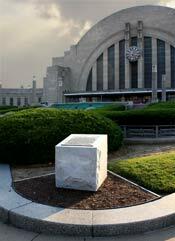 Construction of the terminal began in August 1929 and the cornerstone was set in place in late November 1931. The project would be completed with much fan fare on March 31, 1933 nine months ahead of schedule. On either side of the massive limestone structure, architectural sculptor Maxfield Keck carved symbols of both Commerce and Transportation that seem to be standing guard to the entrance of this last great American train station. The terminal was designed to accommodate 216 trains daily from eight, 1600' long platforms, and service approximately 17,000 people. During World War II these numbers grew to 34,000 passengers each day. The terminal offered more than just passenger service: a gift shop, barber shop, tailor shop, Western Union Office, travelers aid office, a movie theater, the first national bank of Cincinnati, a cocktail lounge, a restaurant, three lunch counters, three newsstands, insurance offices and other assorted businesses. If you arrived by car the terminal offered automobile storage with space for 1000 cars as well as gas filling station. The building's wings permitted drop off and pick up of passengers by auto, taxi and bus. For those waiting to make connections the terminal had places to relax permitting travelers moments to enjoy a magazine or two, do some people watching or just take in the magnificent interior of this great terminal. Bronze doors and Art Deco art provided an elegant and warm environment to spend some time between connections. 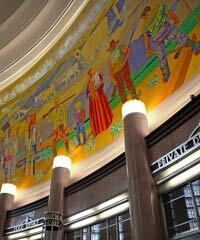 Two large murals lining the rotunda reflected the westward expansion of transportation in America and the importance Cincinnati played in that movement.. Fourteen separate murals were placed through-out the concourse highlighting the city's significant industries and its people. These murals were created by artist Winold Reiss by placing small colored pieces of Italian mosaic into colored stucco. Through the efforts of the people of Cincinnati these mosaics have survived and have been relocated to the Greater Cincinnati Airport where they are still appreciated by today's travelers. Like many of the large train terminals throughout America, the interstates and air travel doomed passenger rail service and the massive railroad terminals that served them for so many years. The last passenger train left the Cincinnati Terminal in 1972 and the Cincinnati Union Terminal Company leased the facility to the city for $1.00. In 1975 the City purchased the terminal and 15 acres for $1,000,000 and began the search to save the terminal. In1980 the Columbus firm Joseph Skilken converted the terminal into a shopping mall and opened the doors with 40 tenants in August 1980. It was a short term venture 5 years later only 1 tenant remained. That year Hamilton County voters approved an $8 million bond levy to convert the old terminal into a museum complex. In 1990, the terminal's new look and new duties began with opening ceremonies in November. Less than a year later, passenger train service once again was offered through Amtrak's Cardinal line running from Washington D.C. to Chicago. Opening the bronze doors is like stepping stepped back in time. People moving between the various attractions make it easy to envision the hustle and bustle of the original terminal. You could imagine the warm welcomes and the tearful good-byes as travelers boarded and arrived on trains from all over the country. It was a pleasure to just stand under the rotunda and let the terminal slowly unfold before me. 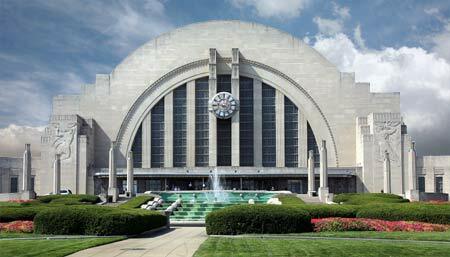 I purchased a ticket to the Cincinnati Museum and began my tour. This museum is laid out with passage ways leading to various periods of historic interest. The main pathway continues the time period of the terminal with a large reconstruction of Cincinnati during World War II. Volunteers tell their stories of their involvement in the war and will gladly answer questions. While studying a display on Cincinnati’s 18th century Fort Washington a young soldier docent dressed in that period approached and asked if I had any questions. In fact I had one concerning a rope bed being displayed. He was unable to answer but asked me to remain and he would find someone that could give an answer. Moments later he returned with a curator who answered my questions and a few I had not yet thought of. From Fort Washington to an 1840 riverside street with a huge river boat waiting at the docks, and the making of WLW and Crosley radio to the timeless streets of Cincinnati the museum held my interest. I was sorry to see my trip through Cincinnati History end. Back in the rotunda I enjoyed a small luncheon before continuing my tour. Another adventure is taking the elevator up to Tower A the original control tower overlooking the tracks and learning how the track switching machines worked. A small museum of train artifacts are an interesting addition. Still other areas of interest are Terminal Tours, Duke Energy Children’s Museum, The Museum of Natural History & Science and the Omnimax theater. Educational programs are available through-out the year such as the Music in the Museum programs and the Heritage Programs. Ohio, as well as the Nation, owes Cincinnati our thanks and appreciation for saving this truly amazing part of America. Every Saturday and Sunday the museum offers free tours of the terminal building. In addition to these regular scheduled tours, there are several other tours offered throughout the year that are typically one of a kind tours. 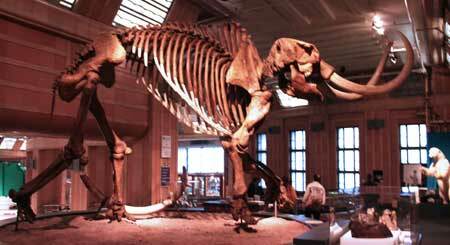 These tours often sell-out quickly and an admission fee is charged. Union Grounds was first built for the Union Cricket club in 1856. After the Civil War, a baseball field was added for the new Cincinnati Red Stockings. America's first professional baseball team. Both sports used the field during the warmer months, and in the winter, the field was flooded and was used for ice skating. The main grandstand was nicknamed "The Grand Duchess" with 2 wings of bleacher seats running down each baseline with a total seating capacity of 4,000, but often, with important events there would be upwards of 12,000 spectators. The field, stands and wood fence surrounding the park were torn down and sold for scrap in 1872. Today there is a marker very close to where home plate was located. 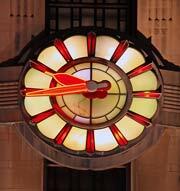 The eastern face of the art deco Union Terminal has a large clock, with neon lights on its hands. The clock is 20' in diameter.